At CorLux Financial, our values are closely aligned with family since that’s exactly what our clients are to us. As we wish to be your financial advisors for life, the values ingrained in our services go the distance. We know that people are complex individuals with specific and unique needs and situations. Truly gauging yours will not be accomplished in one or two hour-long meetings. The level of service we provide is developed over a lifetime, and we’re committed to putting in the time it takes to get there. Ideally, our vision would be that your children or grandchildren would continue to work with our firm, years down the road. We’re committed to being here for you as family partners for life. Honoring God in all that we do is the foundation we strive to build all aspects of our lives upon, and especially in our service to our clients. If this is important to you as well, then you’ve come to the right firm. Our advisors are Certified Kingdom Advisors (CKAs), which means we’ve been formally trained and certified in financial Biblical principles. We’re proud to offer plans to our clients that include Biblical principles and kingdom values. For more details, please have at a look at our Core Values document. 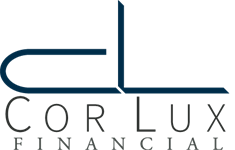 Our name, CorLux Financial, is made up of the Latin words “cor” and “lux” meaning “heart” and “light.” Whether you’re planning for your retirement or in need of a systematic investment* strategy, you can be sure that every move we make with you will be to shed light on your path and put your mind at ease. Whether you’re seeking estate planning guidance or tax analysis and projections, you’ll experience the heart we put into our plan development and advising. * These services are offered by Monica Osborne and Colleen Wallace through their affiliation with HD Vest.